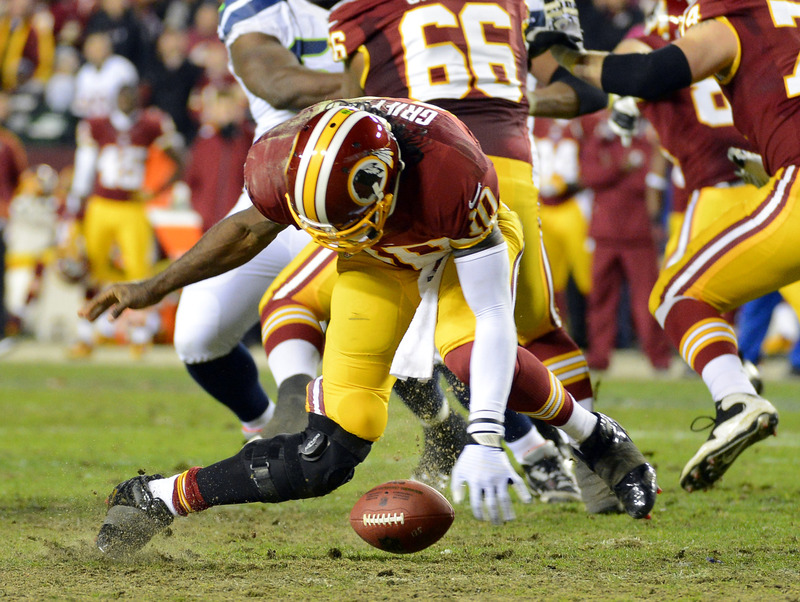 Robert Griffin III essentially ripped his knee in half during the Redskins’ loss to the Seahawks. He is now out for at least 6-8 months and outside of the discussion about whether he should have been playing in real life we are asking if it is ‘In The Game’. Madden Football has continuously disappointed in the realm of realistic injuries ever since Roger Goodell became the Commissioner. While they may have some limitations because of their exclusive monopoly license with the league it is still a major issue that is rearing it’s head as one of the most popular players is possibly facing a career ending/altering injury. In Madden, James Harrison would have been the one getting hurt on this play. Hit detection in Madden has always been spotty at best. Almost everything in the game is pre-determined by animations that are being triggered. There is a specific animation for face mask penalties, fumbles and interceptions. All the while they are marketing Madden’s ‘new’ physics engine as groundbreaking and amazing. EA pushed for consumers to see that “No tackle will ever be the same”… play the game for a couple days and you will see this is false. Physics have improved immensely between Madden 12 and Madden 13, but the biggest part of football has been missing or random at best. Injuries occur in Madden 13 if you turn up the injury slider. However, the biggest problem with this is that every injury in Madden is random and is certainly not determined by physics or tackles on players. Take a look at some of the sacks that occur in Madden 13 and witness your own defender getting hurt during a sack and the QB never getting hurt. Is this a sign that under the hood EA has added injury prevention to QBs? After seeing RG3 get hurt and then tear his LCL and ACL on a play where he didn’t get touched, it makes Madden fans wonder where the injury realism is in the game… and if it will ever be ‘In The Game’.